HU, JI-NIAN HIGGINS, JAMES and HIGGINS, LOUISE T. 2006. 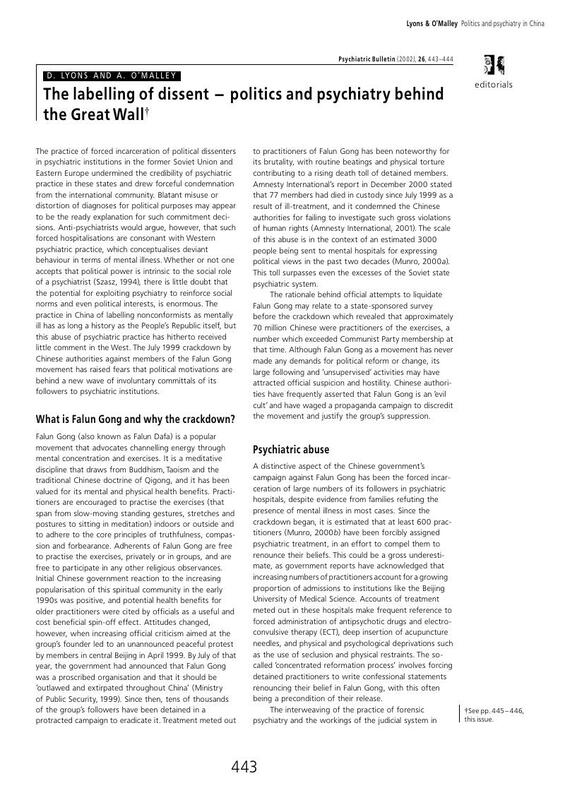 Development and limits to development of mental health services in China. Criminal Behaviour and Mental Health, Vol. 16, Issue. 2, p. 69. Birley, Jim 2004. Political abuse of psychiatry. Psychiatry, Vol. 3, Issue. 3, p. 22. Amnesty International (2001) China crackdown. Amnesty – Human Rights Worldwide, 105, 11. Munro, R. (2000a) Judicial psychiatry in China and its political abuses. Columbia Journal of Asian Law, 14, 103. Munro, R. (2000b) Political Psychiatry in China: A First Glance at the Documentary Evidence. Hilversum: Geneva Initiative on Psychiatry. Ministry of Public Security (1999) Proclamation of the Ministry of Public Security of the People's Republic of China, 22 July. Szasz, T. (1994) Psychiatric diagnosis, psychiatric power, and psychiatric abuse. Journal of Medical Ethics, 20, 135–138. United Nations General Assembly (1991) Principles for the protection of persons with mental illness and for the improvement of mental health care. Report of the Third Committee, A/46/721, 17 Dec.
Wing, J. K. (1974) Psychiatry in the Soviet Union. BMJ, 9, 433–436.